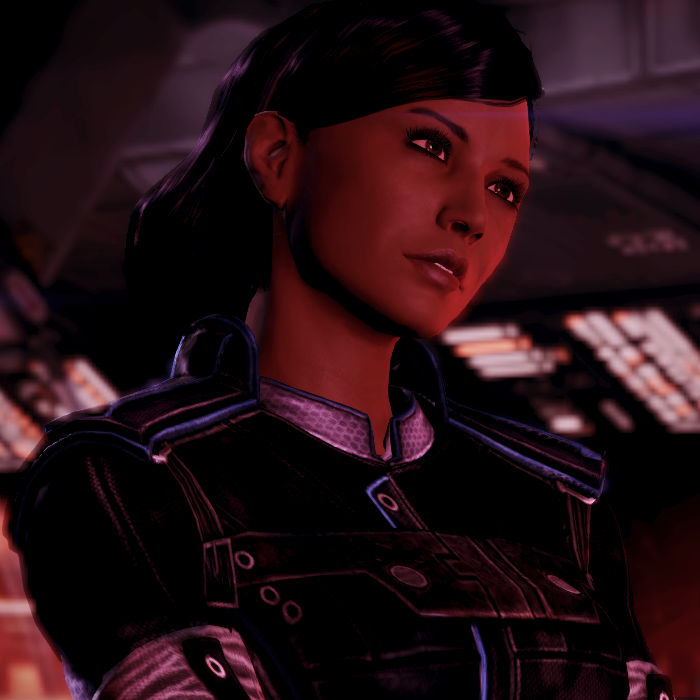 Traynor: Shepard! xoxo. How are YOU! Shepard: I just got out of the hospital. But I feel good. Traynor: Yeah, they’ve been watching you like a hawk since they transferred you from the Normandy. – I visited you while you were sleeping. The nurse wouldn’t let me wake you up. Shepard: That’s too bad. I really missed you. Traynor: Me too! You have no idea how worried I’ve been. But Karin has been keeping me posted. 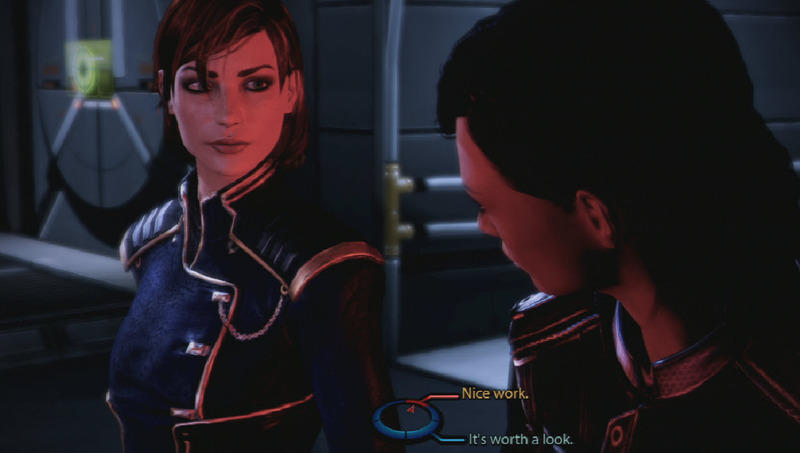 Shepard: That’s nice of her. So where are you now? Traynor: On the Normandy. Doing maintenance work. I’ve been busy ever since she made port. Shepard: How bad is it? Traynor: Half the systems needed repairs. But most of them are complete. Traynor: It’s been two weeks. Shepard: Really? I’ve been out that long. Traynor: Didn’t one of the nurses tell you on the way out? Shepard: I kind of snuck out. Traynor: Oh yeah, I received the invite yesterday. 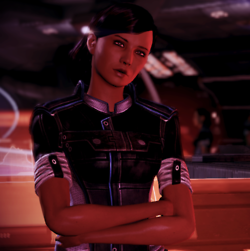 Shepard: I booked reservations and a shuttle if you want to join me? We’d be there a day early . . .
Traynor: I’d love to. But I’ve got too much work. 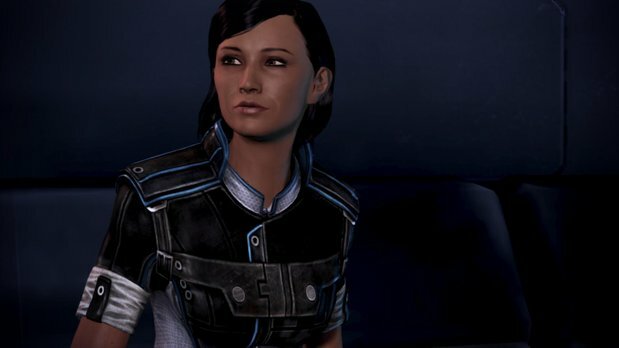 Shepard: I could get Hackett to pull some strings. Traynor: That won’t be necessary. Some of these systems I designed myself. But don’t worry I’ll be on the next shuttle out. I promise. Shepard: I’ll see you tomorrow then. Don’t work too hard Sam. Traynor: I won’t. Take care, I love you. Shepard: I love you too. Samantha gives her a kiss on the cheek and hugs tightly. Traynor – “Maybe later.” She looks outside at the beach and the coming sunset. Samantha gets up from the table and Shepard follows behind her. She steps out onto the beach, feeling the sand between her toes as the warm Summer air blows gently in across her hair, Shepard remarks to herself that Sam looks beautiful in the sunlight. Shepard and Samantha share a lover’s kiss as the sun sets in the background over the horizon of the ocean.